Spelunker is an action-adventure game that was originally released on Atari 8-bit computers in 1983. Your mission is to explore the caves, find keys to unlock doors, and locate the legendary pyramid to claim your treasure. Along the way, you'll need to top up energy by collecting recharge icons, as well as dealing with traps, barriers and enemies; luckily, your character is armed with a Phantom Blaster to shoot ghosts, Flares to scare bats, and Dynamite to blow up rocks. 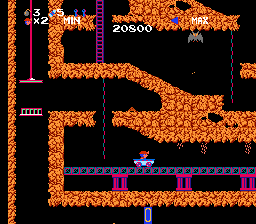 The gameplay is reminiscent of the open-world, exploratory elements of Pitfall II: Lost Caverns (1984, Atari 2600) and the trial-and-error challenge of Rick Dangerous (1989, Amstrad CPC), and involves platforming, climbing on ropes and ladders, and using elevators to delve deeper into the cave. Things get off to a terrible start, as you can only fall a couple of inches without dying, and the controls are extremely unresponsive when jumping off a rope. The trick is to quickly press Forward, release, tap A to jump, then release again; this eliminates 99% of the problems, but it's a quirk that should have been fixed prior to the game being published. With this out of the way, you can enjoy the gameplay and explore the huge, beautifully designed cave. There's so much to explore and obstacles to overcome, and each area is intricately designed to test you. Surviving to reach the next checkpoint is addictive, and I particularly like the mine cart section where you try to dodge falling debris. The intensity of having to continually top up energy to stay alive, while fighting ghosts and venturing into perilous areas to collect keys is a solid hook, and even after you've located the pyramid there's still additional quests to keep you playing (hint: the keys become invisible!). There's no doubting that Spelunker has some avoidable control issues that should have been fixed, but once you've figured out the trick to overcome them there's an exquisitely designed game here that surprises you at every turn. It's chock full of ideas and the gameplay has an impressive level of depth that's way ahead of its time. Random trivia: In 2009, a remake called Spelunker HD was released on the PlayStation 3.